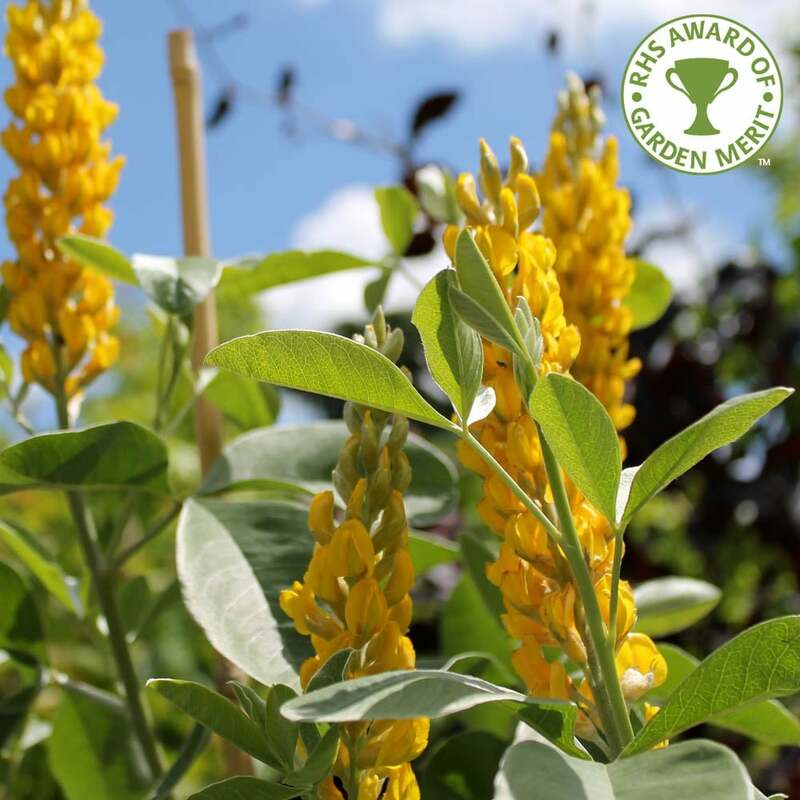 Bright golden yellow, pea-like flowers are held in dense cones or plumes in June – July and give off a delicious pineapple scent which is popular with bees, butterflies and other pollinating insects. The Pineapple Broom or Moroccan Broom tree shouts summer and will do especially well in full sun. The foliage is a silken grey-green, which provides a wonderful silvery foil for other plants. Cytisus battandieri 'Yellow Tail' is a bushy small garden tree or shrub and is ideal for smaller spaces. 'Yellow Tail' is a slightly more compact form than the species plant, and has the RHS Award of Garden Merit. Plant this compact yellow flowering tree near a patio or walkway to enjoy the summer flower fragrance. Our pot grown Cytisus battandieri trees can be planted at any time of year. Remove weeds and grass within a metre of your desired planting hole then dig a square hole as deep as your root mass and approximately 2x as wide. To help your tree establish more effectively, we advise applying Mycorrhizal Fungi root grow. Remove the pot, gently loosen the roots and place into the planting hole. If your soil is poor, mix 50% of the original soil with 50% compost, fill in the hole and firm around gently. Avoid banking the soil up around the collar of the tree. We recommend planting Pineapple Broom trees with a staking kit. For single stakes, knock the stake in at an angle and use a buckle tie with a spacer to prevent chaffing. For more advice, visit the help section. If you’re planting Pineapple Broom in spring or summer, water well and regularly for the first few months. Increase watering if there are extended periods of hot or dry weather. If planting in autumn, you may only need to water a little. Cytisus battandieritrees do not require regular pruning. If you wish to tidy up Pineapple Broom trees, do this during the dormant season. Focus on removing any damaged, diseased or overcrowded branches. If you require a clear trunk, remove any side shoots to help raise the crown.